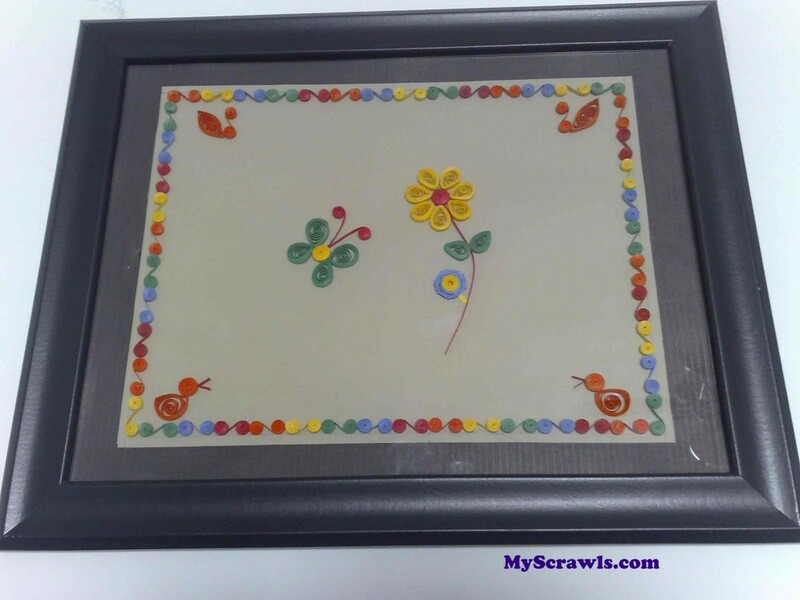 “Quilling” is a paper art where thin strips of paper are rolled/coiled to form different shapes. Then these delicate shapes/patterns are arranged together to form a complete design. 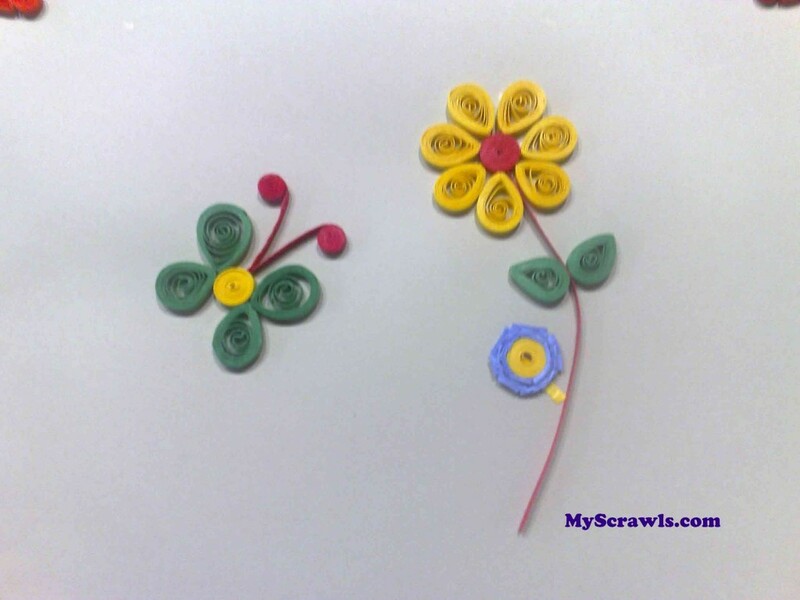 In order to do quilling one needs thin strips of paper and the quilling tool. This tool is basically like a needle with a slot in between that holds the paper strip. Twisting the quilling tool repeatedly, coils the paper strip into different shapes and sizes as needed. As a child, most of us would have had the habit of drawing flower whenever we get pencil to scribble on. Same continues here. Though there are lots and lots of quilling designs available on the net, I first wanted to try a simple flower and butterfly Here is my paper quilling art work. I was thrilled to see the outcome. This has triggered me do venture more in the field of quilling!! Anu this looks absolutely beautiful and so very perfect ! Rombo Super!!! I am back in time to my school days when we did lot of art and craft work. And this one really sounds exciting! Kudos on the superb work! Wow.. thats interesting! Nice work..
Looks beautiful Anu! Expect more nice artwork from you! Keep it up! Eagerly expecting for more creative artwork of this type from ur blog. Awesome! so now our dear Chef Anu makes the transition from Chef to Creative Art designer. This is really amazing! Thank you for your comments Pooja and Inna. Inna, your idea of leaving less space seems good. I’ll try it and let you know how it goes. Great work.. I specially liked the butterfly. This is a very cute piece…great job!! Your blog is nice, some interesting stuff! Hi Anu, you have a nice space here. My aunt recently told me about paper quilling art, which I was oblivious to before. And then on I have been exploring this art online, haven’t tried my hand at it though. You have done a good job with yours. Truly very attractive n lovely choice of colors, very very neat!! I just started learning about paper quilling and I found ur project fantastic. You gave us lot of ideas and I find it very creative.Also I wish to see lot of new designs from you . Wish u all the best. it is very beautiful work.vry neat n clean.i love to see new creative ideas.i make cash covers n invitation cards n do wall paintings on occasions.u can check them on my blog.. n plz reply me hw r they.i will love to knw ur opinion.